Win Tickets To See Rodrigo y Gabriela at The Ryman on August 8th! We recently told you about the upcoming Rodrigo y Gabriela show at The Ryman, and today we’re going to dig a little deeper, and give you the chance to win a pair of tickets to the show. 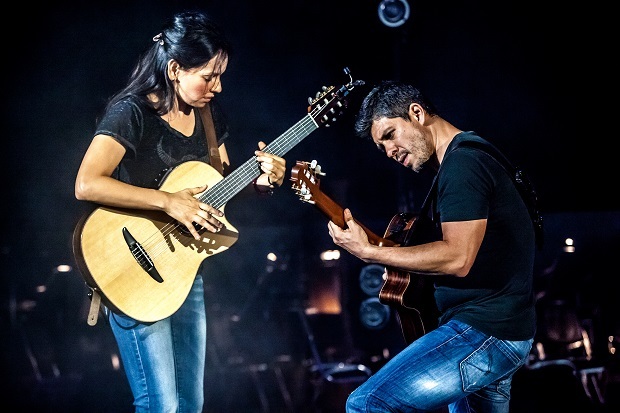 Continue reading to find out why we’ve been frothing for this late summer Ryman show on August 8th, and find out more about the newest album, 9 Dead Alive, from Rodrigo y Gabriela. If you already know all there is to know about Rod y Gab, and you aren’t the gambling type, head on over to grab your tickets for the show here. Rodrigo and Gabriela met as teenagers in their hometown of Mexico City, and soon began collaborating musically. They found similar passions in the flamenco, jazz, and rock standards that were in rotation at their respective family homes; but it was heavy metal and, specifically Metallica, that was their true bond. Together they (with Rodrigo’s brother) began in a mildly successful rock act, Tierra Acida, but, when the opportunities didn’t materialize, they took their act to the beaches on the Pacific Coast of Mexico. Finally frustrated by the music scene of their home country, Rod and Gab packed it up for Dublin, Ireland, and gained near cult status while busking on the streets. Cult status led them to opening gigs for acts like Damien Rice and David Gray, and the release of their debut EP re-Foc. Their 2006 self titled full length debut confirmed their cult status when it hit #1 on the Irish Charts. Fast forward almost 10 years, and Rodrigo y Gabriela are practically festival mainstays, and are currently touring in support of their fifth studio album 9 Dead Alive. The new album consists of nine songs that are written as a “celebration of individuals who have passed on, but through their deeds and words still resonate in the 21st century”. The first single, “The Soundmaker”, that we have included below, is dedicated to Antonio Torres Jurado. Jurado is widely considered the “most important Spanish guitar maker of the 19th century”. He created the first classical guitar that resembles the modern day design, and this design is the basis for most acoustic guitars made today. Not hard to see why this first track on the album would be dedicated to someone that is clearly so influential to the success of Rodrigo y Gabriela. Others honored with dedicated tracks include prominent Austrian psychiatrist Viktor Frankl, African-American abolitionist & humanitarian Harriet Tubman, Mexican scholar Juana Inés de la Cruz, Nobel Peace Prize laureate and renaissance man Fridtjof Nansen, Chilean scholar Gabriela Mistral, Russian writer Fyodor Dostoyevsky, and French Duchess Eleanor of Aquitaine. We’ll try to dig more into other tracks from the album as the show approaches and more are released, but have a listen to “The Soundmaker” honoring Antonio Torres Jurado below, and don’t forget to enter to win tickets at the bottom of the page! If you’re having issues with the above form, you can alternately send your full name in an e-mail to [email protected] with “Rodrigo y Gabriela” in the subject line, and please let us know if you shared on Facebook. Rodrigo y Gabriela will perform Friday August 8, 2014 at The Ryman Auditorium. The show is all ages, begins at 8pm, and tickets are available to purchase for $35 to $45. Catch Young Jesus w/ Baby in the 90s & Bennet Littlejohn | Sunday, Nov 8 @ Exponent Manor!